Jobu examines the Yankees catching situation in 2013, and what they might be able to do to improve for 2014. 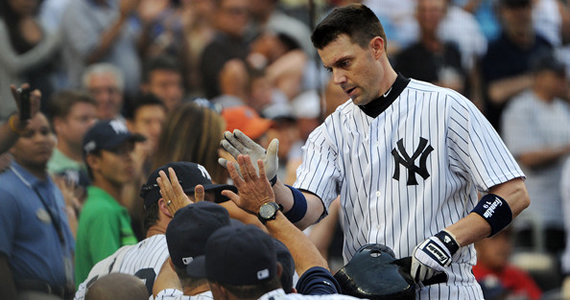 It goes without saying that the Yankees catching situation left a lot to be desired in 2013. Even before the season began, things were bleak. Russell Martin left for Pittsburgh, which left the Yankees with a Spring Training competition featuring Francisco Cervelli against Chris Stewart. Needless to say, we were not optimistic going into April. Things weren’t all bad, but let’s take some time to evaluate what went wrong, what went right and what the Yankees can do to make sure that there isn’t another black hole in the lineup come 2014. Usually, we’d start these posts with the more optimistic side of things, but I really wanted to stress how bad things got for the Yankees last season. Despite Joe Girardi‘s best efforts, Cervelli all but beat out Chris Stewart for the starting catching job out of Spring Training. I say all but because Girardi split their playing time pretty evenly during the first couple of weeks of the season. What is it with slap hitting catchers having each other’s backs? Anyway, Through his first 16 games, Cervelli hit like he never really had before, putting up a slash line of .269/.377/.500 with 3 doubles, 3 homers and 8 RBI. He also showed a ton of patience at the plate (8 BBs) and played solid defense as well, throwing out half of the guys who tried to steal on him. He did have one problem though. He didn’t know where to put his hands. On one occasion, he carelessly left his throwing hand out in front of him and took a bad foul tip off his knuckles. Twice, he extended his glove hand too far and was hit by the bat, resulting in catcher’s interference. The second one of those also resulted in a broken hand, and Cervelli missed the rest of the year. Even if he had made it back, he would have spent the last 50 games of the year at home, because he was suspended as part of the Biogenesis stuff. Maybe that’s why he was hitting as well as he was? We’ll probably never know for sure. Joe Girardi must have thrown himself an I Love Chris Stewart party when he got the news, because the Yankees seemingly had no interest in trading for a new backstop. Stewart was plugged into the every day role and Austin Romine was called up to be the backup. Ideally, Romine would have slowly taken the reigns from Stewart as the season progressed and eventually supplanted the career backup, but that wasn’t going to be the case. Romine was about as bad as one can be at the plate the first couple of months he was up with the team. This justified Girardi’s seemingly irrational love for Stewart, because Stewey became the starting catcher full time after that. Don’t get me wrong, I love Chris Stewart… as a backup. He plays solid defense, calls a great game and gets a timely hit here and there to boot, which is all you want from a backup catcher. The problem with playing a backup every day is that, eventually, they get worn down from the extra workload and exposed at the plate for their lack of talent. Stewart was asked to do more in 2013 than he ever had in his entire seven year career. He played basically twice as many games, and had twice the at bats, as he ever had. He performed admirably, but his slash line of .211/.293/.272 was a rally killer all year long. In a normal season, the Yankees would have been able to carry a terrible bat from the catcher position, but with all the injuries and terrible free agents they endured last season, they couldn’t, and things got ugly. Let’s get back to Romine for a second. In the last month or so of the season, he really showed me something. He was playing great defense, which was never a question, but he finally started swinging the bat too. Overall, he slashed .207/.255/.296 with 1 homer and 10 RBI in 60 games, which is pretty bad. In August, however, he hit .303/.400/.455. During that month, he finally started pushing Stewart for playing time, and helped the team’s resurgence in the playoff hunt. Naturally, because that’s just how things went down in 2013 for the Yankees, Romine suffered a concussion in early September and was lost for the rest of the season. That tough break led to the call up of another rookie backstop, J.R. Murphy. If you’re like me, you’ve been following Murphy for the last couple of seasons, and you watched or read about his impressive climb through the minor leagues in 2013. He started the season in AA Trenton and performed well enough to earn himself a call up to AAA Scranton/Wilkes Barre after 49 games. He held his own at AAA and, when Romine went down and the Yankees were really out of options, Murphy got the call. He made his big league debut on September 2nd against the White Sox, singled in his first at bat and ended up hitting .154/.185/.192 in his 26 at bat cup of coffee with the Yankees. He was also the last man to ever catch a pitch from Mariano Rivera, which means he was on the mound when Andy Pettitte and Derek Jeter came out to the mound and caused one of the most emotional scenes in Yankees history, which makes him the answer to an awesome trivia question. I can see a scenario where the Yankees, trying to get under that $189MM luxury tax threshold, would come back in 2014 with the same group of guys and see who can stick. However, I do propose that they let Stewart walk. I feel bad, because it’s not really his fault, but he was so overexposed in 2013 that I can’t stomach having him on the roster for another year. Let him go land a backup job on another contender if he wants, or anywhere else really. I think Romine showed enough this past season to merit a big league job in 2014. I think he might be ready for the next step, which is to be paired with a veteran backstop and playing twice or three times a week instead of once. If the Yankees decide not to make a big splash in the trade or free agency markets this off-season to address the catching situation, I think Cervelli is a perfect candidate to do this time split with Romine. I would then stash Murphy at AAA in case one of the two gets injured. However, that’s the problem. If history tells us anything, it’s that Cervelli, Romine or both will get injured in 2014. 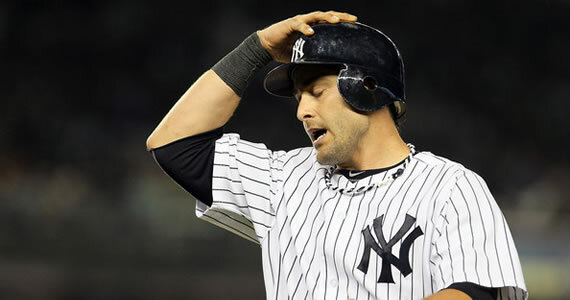 Cervelli has had a series of freak broken bones or an injury of some kind or another for a few years now, and Romine missed most of 2012 with back problems and has now had his first concussion. The Yankees don’t want to get stuck in a situation where, all of a sudden, Murphy is their only catcher. The other option the Yankees have is to bring in someone from the outside. They could go for a veteran like Carlos Ruiz from the Phillies, who can hold his own at the plate and plays great defense. At soon-to-be-35 years of age, Ruiz presents a greater health risk, but he’s basically what any team needs at catcher, and would probably come a lot cheaper (and with less of a time commitment) than most of the other options out there. 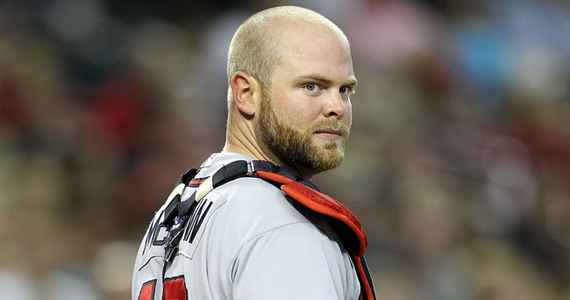 Now, if the Yankees really want to make a splash, they could go out and sign a guy like Brian McCann. McCann is an about to turn 30, left handed hitting masher who has spent the last nine seasons with the Braves. McCann can do it all with the bat and the glove, and he’s a great character guy. Seriously, he twice confronted players this season for showboating after home runs. One of them was Carlos Gomez, whom McCann intercepted half way down the third base line. He didn’t even let the guy touch home plate before getting in his face! Unfortuantely, like many 30+ catchers, Mccann will also present a health risk. Ailments in his eyes and shoulder have limited him to 128 games or under the last three seasons. 128 isn’t half bad for a starting catcher, but 102, which is how many games he played last year, is unacceptable for someone making the kind of money McCann is sure to make from his next contract, but he might be worth the risk if the Yankees have a decent backup. There are probably other options available to the Yankees as far as catching is concerned. I think what they do behind the dish will depend a lot on the other moves they do or do not make. If they end up letting Canó or Curtis Granderson go, and A-Rod gets suspended, that could open up enough money to fill the catching spot and still sign a couple of other good players, including Masahiro Tanaka, whom we spoke about earlier this week.